This property may be affected by the Beach Nourishment 2019 shoreline management program. 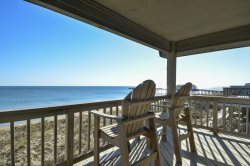 Enjoy the magnificent Outer Banks sunrises on the top deck of this comfortable beach cottage in South Nags Head. Love Pocean offers both privacy and tranquility with its Oceanfront location. Walk over the private walkway to the beach or have a peaceful day relaxing on the sun decks. No matter how you want to unwind, Love Pocean is a potent remedy for the stresses of everyday life. The coastal-inspired interior of Love Pocean is just as refreshing as the killer oceanfront location. Step inside, and enjoy the stunning Atlantic vistas from the top level great room, where a spacious kitchen, living area, and dining area can be found. There’s ample privacy on the second level, which is outfitted with four cheerful bedrooms, and the bottom level with a storage room and outside shower makes it easy to refresh after a long day at the beach. From the sweet walkway to the sand to the gorgeous views from the sunny interior, Love Pocean is a potent vacation home that everyone will want to enjoy again and again. Wonderful trip to OBX! Loved the house, very clean and views were fantastic! All 3 kids loved playing on the beach and some fishing. Would love to stay again!